Here is finished model with body shell fitted. I still want to add some sponsor stickers at some point but this is it with most of the Tamiya stickers applied. I am not a fan of the Stickers that come with Tamiya body shells especially the ones for the windows. I have not given the model a proper test outside yet but in the quick go I did have with it I noticed the motor is too much for the wheelie bar. Full throttle will put the truck on its roof almost instantly. I found the sweet spot for wheeling was around 80% throttle. After landing a wheelie you can then apply full throttle to speed up as the front will not lift again until you slow down. Over the last few evenings I finally got round to building the Volkswagen Wheelie Camper that I got in the Modelzone closing down sale. The Car is complete except the body post mounts and the stickers on the bodyshell. I have replaced all bearings and bushings with ball race bearings and upgraded the motor to a 12×2. This of course also required a different ESC as well. I gave it a Spektrum splash proof receiver as Spektrum is the only radio technology I use if I can help it. This means I can bind and control all my models from a single transmitter. Tamiya were a bit cheeky with this kit as it said it included a ball race option pack but there were not enough bearings to go around. Luckily I have a bag of them so this was not an issue. I made the mistake of giving this a quick test indoors. This lead to it hoping off the spot doing a back flip and smashing the on/off switch. To fix this I had to solder the wires together where the switch once existed. I think I will finish mounting the shell before playing with it anymore! Posted on February 13, 2014 Categories Car, Electric, Model Kit, Remote ControlTags build, camper, Kit, Modelzone, monster, race bearings, rc, Tamiya, truck, upgrade, van, volkswagen, wheelieLeave a comment on I have created a monster! Bashing with my Twin Hammers and Losi Micro short course truck. Format ImagePosted on April 14, 2013 April 14, 2013 Categories Car, Electric, Mod, Remote ControlTags car, electric, Electronics, monster, proof, rain, rc, Remote Control, Tamiya, truck, upgrade, water, waterproofLeave a comment on Why I can drive my car in heavy rain. Taking our souped up Tamiya Blackfoot monster trucks for a bash in the park and skate park. I decided to once again upgrade my motor on my electronic monster truck. The maximum upgrade people seem to recommend for a truck of thistype is a 12 turn with x2. the x2 gives it a little more torque to make up for the torque lost by using a lower turn motor. In order to use this I also had to replace the stock speed controller with one that would support a 12t motor. The motor is an LRP v10 spec5 12×2 and I am using a Modelsport Sniper RV-12 ESC. 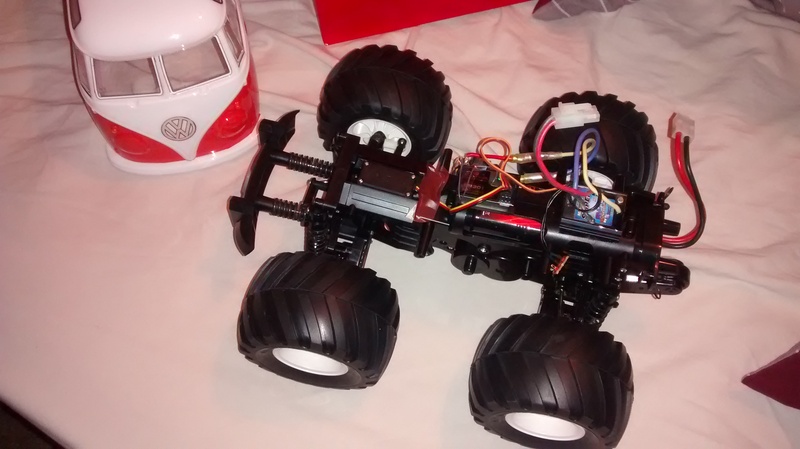 They seem to give the truck a nice boost compared to the small gain received by upgrading it with a tamiya motor.